PRP is a hair treatment technique that uses a patient’s own blood to help encourage hair growth through the delivery of concentrated growth factors to hair follicles1–3. Seven randomized controlled trials have been recently published that examine the effects of platelet-rich plasma (PRP) in androgenetic alopecia (AGA) patients. One of these studies was conducted in 2015 by Gentile et al4. In this study, 23 men with androgenetic alopecia were treated with PRP using a half-head technique; half the scalp was treated with placebo and the other half was treated with PRP. 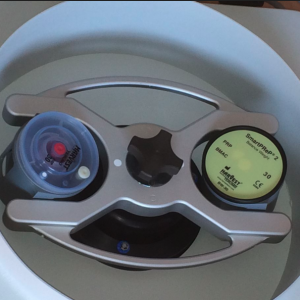 To create the PRP solution, the investigators used a single spin technique and incorporated an activator (Ca+) to help stimulate the release of growth factors3,5. Three sessions were given to each patient with a 30 day interval between each session. After 14 weeks, there were 36.8 more hairs per cm2 on the PRP treated area as compared to the placebo area (p < 0.0001). Specially examining terminal hairs, hairs that are considered fully matured and are long and thick in appearance, there was a considerable improvement in the treatment area as compared to baseline measurements (an increase of 40.1 hairs per cm2). Conversely, there was a decrease in the number of terminal hairs (a decrease of 5.6 hairs per cm2) found on the placebo side of the scalp as compared to baseline. Dr. Puig and his colleagues also investigated the impact of PRP in AGA patients but found contrary results6. In Puig et al.’s study, 26 women with androgenic alopecia were separated into two groups. One group received a PRP injection while the other group received a saline injection. Using scalp photos, hairs were counted and treatments were compared 26 weeks after treatment. No differences in hair count (mean difference from baseline) were found between the PRP treated patients and saline treated patients. Despite this result, the patient survey conducted during this study suggested that 13% of PRP treated patients felt a substantial improvement in their hair loss whereas 27.3% of patients in the placebo group only felt some improvement. In 2017, Gentile et al., conducted follow up studies exploring PRP’s influence on hair restoration in AGA patients (study 1) as well as the differences between the systems used to create PRP (study 2)7. In study 1, 18 men with androgenetic alopecia were treated with placebo and PRP using a half-head technique. A total of 3 sessions were conducted with 30 days between each session. At week 12, both hair count and hair density were significantly higher in PRP treated areas as compared to placebo treated areas. In the PRP treated areas, there was an increase in both hair count and hair density as compared to baseline measurements (36 hairs and 64 hairs, respectively). This substantial increase was not present in the placebo treated areas reporting a 1 hair increase in hair count and a 2 hair increase in hair density as compared to baseline. In study 2, six men with androgenetic alopecia patients were divided into two groups. The first group was treated with PRP created using the Regen Blood Cell Therapy system (Regen group) and the second group was treated with PRP created using the Arthrex Angel system (Arthrex group). After 6 months, the patients in the Arthrex group experienced an increase in hair density (90 more hairs per cm2) while patients in the Regen group experienced a decrease in hair density (73 less hairs per cm2). Growth factor concentrations were not statistically significant between the levels produced by the Regen and the Arthrex systems. Even though comparable growth factor concentrations were found between systems, this study does suggest that the choice of system used to produce PRP could impact hair restoration parameters such as hair density. Similar to Gentile et al.’s studies, an improvement in hair density was also found in a recent study conducted by Tawfik & Osman8. In this study, PRP treatment in 30 female patients with androgenetic alopecia was investigated. Using a half-head technique, four weekly sessions of placebo (saline) and PRP injections were given to each patient. Six months after treatment, the PRP treated side experienced a greater improvement in hair density (77.28 more hairs per cm2) as compared to the placebo treated side (17.81 more hairs per cm2). Study design differences and systems used to create PRP solutions might help explain some of the differences found between recent PRP studies. With the exception of Puig et al.’s study, all recent randomized-controlled PRP trials conducted in AGA patients use a half-head study design. Half-head study designs may not be the best method to use with PRP as PRP may encourage the development of new blood vessels (angiogenesis), potentially affecting placebo sites. In addition to study design, as seen in Gentile et al.’s 2017 study, the system used to create PRP could influence hair restoration results. In summary, several recently published studies support the use of PRP as a hair restoration treatment in androgenetic alopecia patients. Positive results have been found with both male and female patients and have shown significant increases in hair restoration parameters such as hair count and hair density. For more information about PRP, please check out our previous blogs entitled “Platelet-Rich Plasma (PRP) for Hair Loss” and “The Vampire Treatment”. Dhurat R, Sukesh M. Principles and Methods of Preparation of Platelet-Rich Plasma: A Review and Author’s Perspective. J Cutan Aesthetic Surg. 2014 Dec;7(4):189–97. El-Sharkawy H, Kantarci A, Deady J, Hasturk H, Liu H, Alshahat M, et al. Platelet-rich plasma: growth factors and pro- and anti-inflammatory properties. J Periodontol. 2007 Apr;78(4):661–9. Gupta AK, Carviel J. A Mechanistic Model of Platelet-Rich Plasma Treatment for Androgenetic Alopecia. Dermatol Surg Off Publ Am Soc Dermatol Surg Al. 2016 Dec;42(12):1335–9. Gentile P, Garcovich S, Bielli A, Scioli MG, Orlandi A, Cervelli V. The Effect of Platelet-Rich Plasma in Hair Regrowth: A Randomized Placebo-Controlled Trial. Stem Cells Transl Med. 2015 Nov 1;4(11):1317–23. Arshdeep, Kumaran MS. Platelet-rich plasma in dermatology: boon or a bane? Indian J Dermatol Venereol Leprol. 2014 Feb;80(1):5–14. Puig CJ, Reese R, Peters M. Double-Blind, Placebo-Controlled Pilot Study on the Use of Platelet-Rich Plasma in Women With Female Androgenetic Alopecia. Dermatol Surg Off Publ Am Soc Dermatol Surg Al. 2016 Nov;42(11):1243–7. Gentile P, Cole JP, Cole MA, Garcovich S, Bielli A, Scioli MG, et al. Evaluation of Not-Activated and Activated PRP in Hair Loss Treatment: Role of Growth Factor and Cytokine Concentrations Obtained by Different Collection Systems. Int J Mol Sci. 2017 Feb 14;18(2). Tawfik AA, Osman MAR. The effect of autologous activated platelet-rich plasma injection on female pattern hair loss: A randomized placebo-controlled study. J Cosmet Dermatol. 2017 May 14.